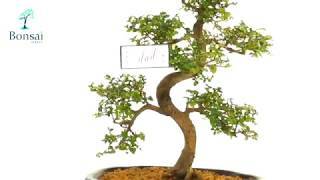 This gorgeous indoor Chinese Sweet Plum Bonsai tree makes a delightful and unique Father's Day gift. With a drip tray, bonsai feed, pruning scissors and free care instructions, your dad will have everything he needs to get started in the art of bonsai. The 'Best Dad' tag, blue jute and blue spotty ribbon around the ceramic pot makes this gift even more extraordinary. The Chinese Sweet Plum bonsai is great for beginners, and is also ideal for indoor gardening. When the bonsai has matured, tiny purple plum-shaped fruits appear on the tree during the summer months. The Chinese Sweet Plum is an incredibly beautiful tree, with lush green foliage that is often tinted with a rusty red colour. You can also personalise your gift by adding a free gift message, or a plaque label. To make your gift even more special, add some gift wrap from our large selection. We offer free delivery to most areas of the UK.